The greatest crime that The Three Lions commits is lodging Baddiel and Skinner's song of the same name firmly on my head. For three days now that earworm has been munching its way through my brain, showing no signs of the same name. 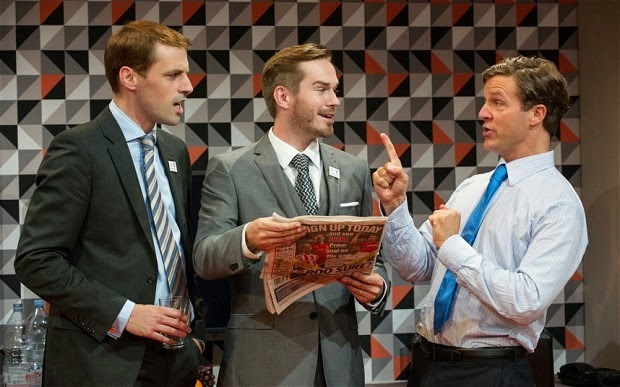 But this song, hailing British sporting accomplishment and massaging patriotic fervour, is the perfect accompaniment to this satirical play that examines a puffed up and pompous Britain's place on the world stage. Set behind the scenes of England's abortive bid for the 2018 World Cup, we follow the bizarre trio of David Cameron (Dugald Bruce-Lockhart), Prince William (Tom Davey) and David Beckham (Sean Browne). These three titanic egos, equally uncomfortable with the other's presence, are forced to combine their talents on (what we know to be) an utterly doomed venture. They're aided by obsequious hotel aide Ashok (Ravi Aujla) and unassertive PA Penny (Antonia Kinley). Along the way lie trouser malfunctions, indignant Australians, greedy FIFA officials, imaginary corgis, hilarious pranks and, overseeing everything, the spectre of Rupert Murdoch - the bane of all three men. Knowing that their frantic efforts to secure the bid are pointless makes this a study in failure; our pleasure coming from watching these three rub up against each other in increasingly ridiculous ways. There's a strong whiff of The Thick of It in The Three Lions. A typical plot in Armando Iannucci's wonderful TV show sees high profile men running as fast as they can to stay in the same place, their efforts to contain the situation only making it worse. It's classic farce, with the acidic edge that these men are purportedly the cream of Britain's elite and run our lives. Another similarity is The Three Lions dogged avoidance of ideology. While Cameron, William and (to a lesser extent) Beckham are political figures, they're presented first and foremost as fallible, clumsy and rather dim human beings. In concert, they very faintly resemble the Two Ronnies famous 'class' sketch. With his ancestry of Lords and Ladies it's a stretch to paint David Cameron as a representative of the middle classes, but he's bumbling, self importantly incompetent, so the shoe fits. Bruce Lockhart's Cameron is the type to be constant rolling his sleeves up, deploying carefully considered dynamic body language, over-enunciating each word and using knackered management techniques on the two men. He's man torn in two, caught between the twin poles of William's ultraestablishment injokes (the two perform a sickmaking Eton schoolboy dance) and Beckham's enviable popularity and celebrity. Davey's William is slightly less complex, essentially an embryonic Prince Charles. He's eager to be seen as 'one of the lads', but ends up as a kind of embarrassing Dad-to-the-country. Acutely embarrassed that his status in society is entirely founded on his relatives, he tetchily defending himself by exclaiming that flying a helicopter is "really hard!" But lurking under the surface of his everyman act is snippy pedantry - he constantly corrects both Cameron and Beckham on their speech, as if he can't resist displaying superiority over them. This makes Beckham, uncannily played by Browne, as the most likeable of the bunch. Sure he's a shallow moron, but at least he's a harmless shallow moron. Key to Brown's performance is the mastery of the Beckham eyebrows, teased and taut as if directly connected to the cogs in his head. His frequent pauses to process new information give him a doglike aura, practically cocking his head with curiosity as he struggles with basic maths. This open idiocy exposes the concealed idiocy of Cameron and William, dragging them both down with him. It's Beckham that gets most of the big laughs in the show, one of the best simply being the first time he talks. Browne is possessed with uncanny comic timing and good looks that fall just on right side of silly, imbuing Beckham with a weird vulnerable nobility. It's as if he knows he's not too smart, yet has turned that negative into a positive. Compared to him, the other two are somewhat less dramatically chewy. Davey's William compares badly with Oliver Chris' portrayal in Prince Charles III earlier this year, recognisable but blurred. Meanwhile, Cameron is suitably detestable, but the portrayal is a bit one note. Worst of all is Aujla's hotel attendant Ashok, who spends the entire play talking in a cringeworthily broad comedy Indian accent. Whenever the character is on stage the laughs drain from the room as he painstakingly picks through slow monologues that takes for-goddamn-ever to get to the point. That he's clearly intended to be annoying doesn't make his presence any more pleasant to be around. This lands The Three Lions firmly in 'pretty good' territory. There are moments of subtle cleverness like the expanding/contracting hotel rooms that signify each character's status, and at least ten really great jokes. But there's a sense that something is imperceptibly amiss in the way the three performers mesh together, together with a script that goes for the easy laugh a couple of times too many. Far from a disaster, but not exactly must-see material either. 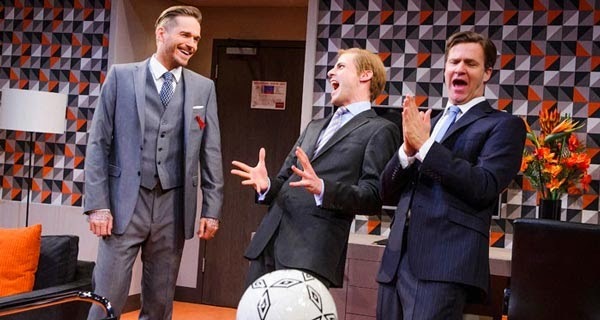 Three Lions is at the St James Theatre until 2 May 2015. Tickets here.